Today we began our first project using our Asus Eees, and opened with a basic skills session. The primary aim of the day was to make sure we could log onto the wireless network, log in to the VLE, and to familiarise ourselves with some of the processes and tools we will use during the development of our Challenge. 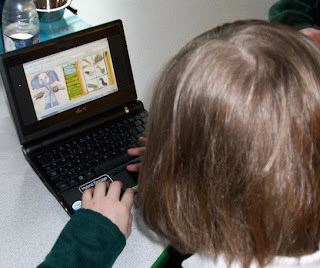 Our literacy session today was desktop based and involved talking as readers, using printouts from onscreen resources. 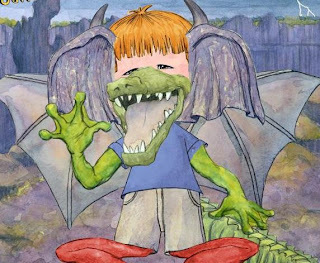 In our project this week we do not want the children simply copying and pasting material from the web, but want them to engage with the texts to pick out key ideas. The first thing that struck many of them was the technical vocabulary in a text about weather and climate. The children were encouraged to use highlighting to locate unfamiliar words and phrases that we could discuss as a group. These included words such as cyclone, tropical, monsoon, earthquake and drought. Some of these not only raised discussion around their meanings, but also lead to some interesting discussions around decoding. What was useful here was being able to highlight how in reading these we had encountered problems ourselves in understanding and taking meaning away, what would have happened if we had simply copied and pasted it? This lead to discussions around the seasons, what was meant by tropical and why some regions were called the tropics. We needed a globe to see this and a timeline to help us see when winter, summer and the monsoon seasons happened. The children were intrigued by there not seeming to be a spring or autumn, but rather three seasons from the text we had explored. We will be revisiting and building on this work, as the students begin to use the ideas we explore in literacy sessions this week in their presentation challenge. 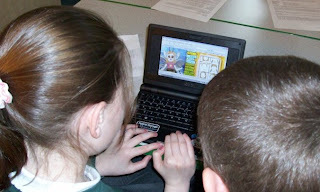 Moving on in the next session we began developing and reintroducing some of the ICT skills they will need to use in the challenge. Here we worked through the log in process for using the Wireless network, booting the machines up and using the network tool to locate the connection we had made last week and practicing again the connection process. 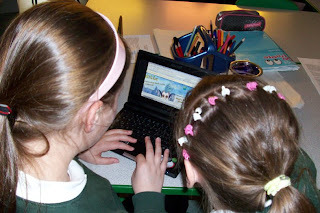 Once we were online, the students navigated to the VLE and logged in. The next stage of the activity was to reply to an email that I had prepared for today's session and sent to each of them prior to the task. This contained a very simple message welcoming them to the challenge and asking them to reply with a greeting that would let me know that they had managed to get online. On reciept of this email I returned the compliment by forwarding each a link to the build yourself wild website introduced through Twitter by colleague Doug Dickinson a few weeks ago. The expectation was that each pair of students would take turns to send their email, log out so their partner could then also reply to my email. In the process praciticing the log in and out process for the VLE. When they logged back in their reply would then be waiting for them. As well as learning about life in India this term we have been working on a science topic on habitats. The children were encouraged while designing their wild self to think about where their beast would live and to select from the features available to them, those that would help them to survive in their chosen habitat. 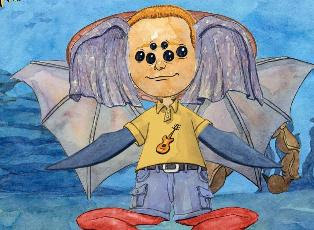 On completing their creature the children were asked to create a desktop wallpaper at the site and to save this to their computer. Both children in the pair carried out the task, and as a finale, were shown how to and required to upload the activity to our shared space. This process may seem quite mundane. But if we are going to use this space effectively it is an essential prerequisite that skills such as this become second nature, and if the rest of this week's activities are to be successful the key skills worked on in this session will be central to the work the children do. Many of these skills and processes had been engaged with before, through blogging activities and through work in Honeycomb earlier in the year. Processes such as this are easily transferable across platforms, but every environment has its own particular quirks and ways of doing things. It is easy to assume that the students will just know how to do this as a result of previous experience. The students seemed to enjoy learning and revisiting these through this particular activity, they were keen to learn how to do the next thing as they built on each activity in stages. The tasks that follow this week will further build on and consolidate these tasks in other practical contexts. BECTA Filming, Podium and Oral Storytelling.